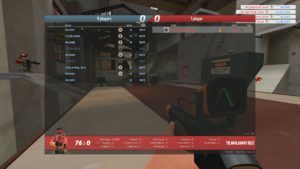 Since Team Fortress 2 is really losing in the first person shooting games battle, mainly against Overwatch, players have been doing a lot of other stuff in the game like tinkering with console commands and how they can make the game a little more interesting. Just like TF2 Trading, game has been so dull that’s why they just tinker with console commands. I was messing around with some new custom arm animations for the engineer on tr_walkway when I noticed that I had 2 sentries. Here is how to replicate this: – step 1: open the console and type “sv_allow_point_servercommand always” – step 2: laod tr_walkway (I haven’t tested every map but so far tr_walkway is the only map where I got this to work, I think it may have something to do with tr_walkway not having any setup timer at the start). – step 3: build a sentry, this can be a mini sentry or a normal sentry. You can upgrade it as much as you like. – step 4: go into options-video options-advanced and open the drop down box for ‘high dynamics range’ to something other than what it is already set to. – step 5: click apply, it will want to reload the map. Once the map is reloaded the original sentry should still be there but the game doesn’t count it as your sentry, so you can go and build another one. – step 6: repeat steps 5 and 6 as much as you want to have infinite sentries!! Note: this will work with all engineer buildings but when you restart the map the teleporters don’t stay synced to each other, they just sit there. All images regarding his post can be found here. I wonder if there are commands that can affect TF2 Items in the game as well. Hopefully there are more of this to come.